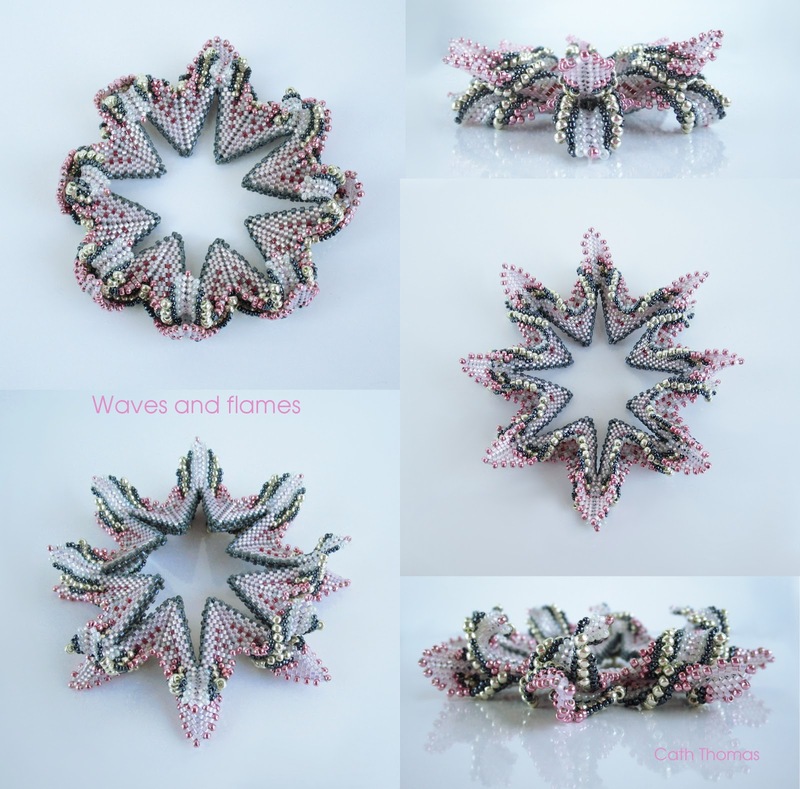 What can a visitor, waves, flames and a skull have in common? 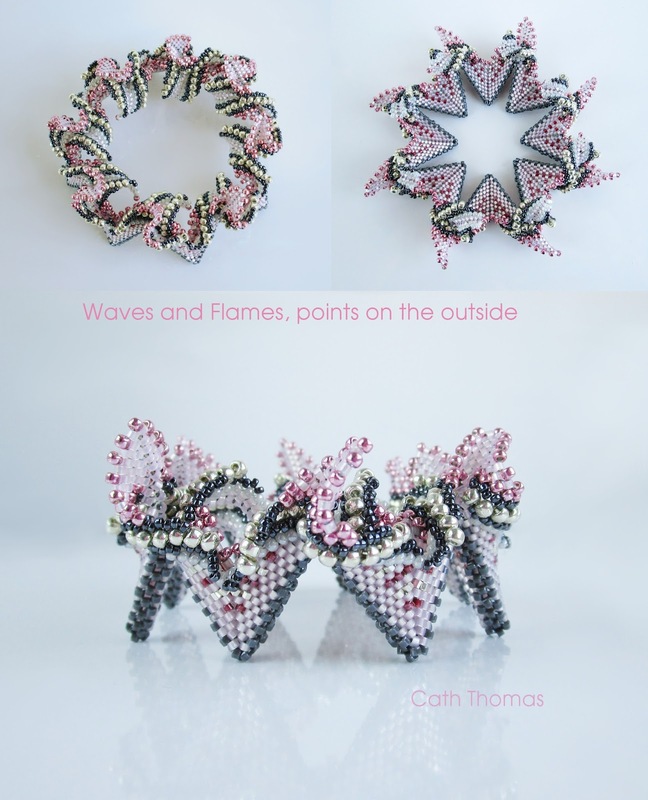 I don't think that I ever blogged about my Embers Cuff, which I made in 2015. It is a curled-up Jalisco Bangle made with twisted peyote (also called Cellini method) or, as in Contemporary Geometric Beadwork talk, an All wing. Admittedly it doesn't look like an all-wing, but that's because it is partially zipped. It could also be seen as a partially zipped 18-point (9 on each side) Yukka flower, which was actually the first 'All wing' that I made back in 2010, and where my collection of zig zag shaped creations all come from. Because they are zipped, my Yukka flowers look like puffy flowers. I like to fold and zip and curl peyote beadwork. It's so much fun. Embers was a crazy thing to make. I called it gymnastics for the hands. It's impossible to tutify and quite impossible to teach, because it breaks needles if not beads. Artistic madness, but still a wonderful experiment. I'm very proud of it. Why do I write about it now? Because I had the visit of a really lovely lady, Esra. 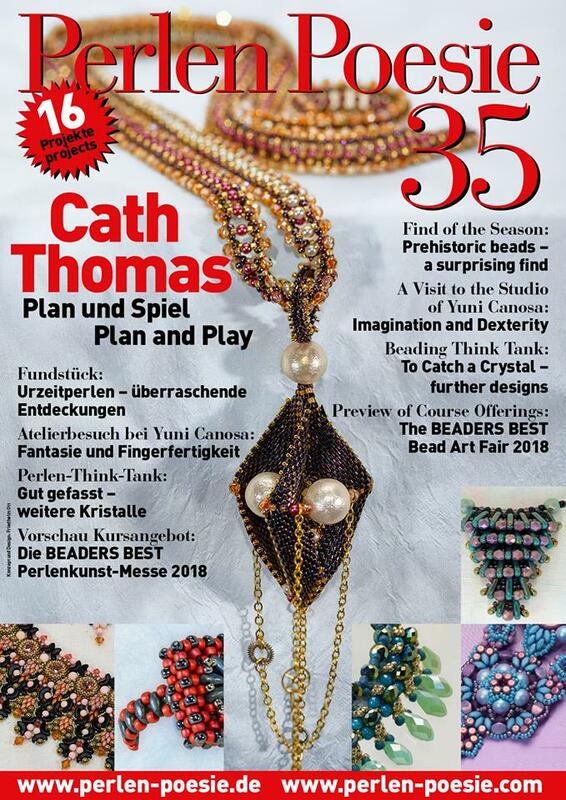 After having seen my beadwork in the Contemporary Geometric Beadwork books by Kate McKinnon, she contacted me a bit timidly via my Etsy shop to ask if I did workshops in Eastern Switzerland, or maybe elsewhere. I explained that my light-sensitivity doesn't let me do this, so she asked if she could come to my place and if, perhaps, we could make an Rick Rack start with an MRAW band together. I liked how she wrote to me and accepted with pleasure, although wondering why she wanted to do an MRAW band, seen that it is pretty well explained in the book. You can also learn a lot from various free tutorials. To make a Rick Rack for the occasion, I looked back at Embers and thought 'why not try a Flaming Cuff on a Rick Rack start', to offer a simpler method, teachable, and maybe easier to adapt in size. It resulted in this lovely soft pink and silver "Unfinished Wave & Flames" cuff. One side is different than the other, because I made a "happy" mistake. You know, one that you decide to stick with and it results in something unexpectedly cool. I like it a lot and will take the idea further. It looks different from every angle, so I made many photos to show that. Notice how the points and flaps twist off-center when the 'legs' of the Rick Rack are standing up, which is how it sits on the arm. ￼These points and flaps can be twisted in various directions. It makes me think of air, of wind and of bouncing water. It is very playful. I could take the MRAW band off, to make two separate cuffs and re-use the MRAW band. I could add pearls which would freeze the form (I love pearls). But somehow I like it as it is. Unfinished, not frozen, still modifyable. Esra came by train yesterday, from beautiful canton Appenzell, in other words the other side of Switzerland, which took her 4.5 hours to come, and 4.5 hours to go back (it's a small country but this still is a long journey for approximately 4 hours beading together, which passed by way too fast). I was a bit nervous that she'd be incommodated by the many birds in the same room even though she told me that she wasn't allergic to birds. She loved it. She loves nature as much as I do. And the beading area offered enough space for the two of us. The works in this room aren't finished (repainting, etc), but I arranged it a bit to make it a nice beading area. 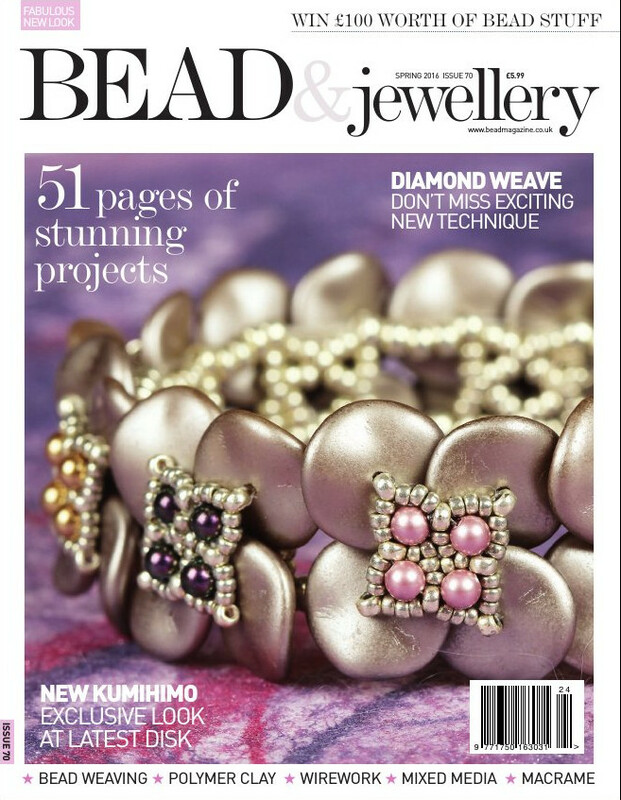 Beading area. The birds are on the left (opposite wall). We had a wonderful time. We enjoyed a good home-made chocolate-peanut butter pie with coffee. 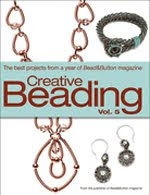 We fondled beadwork, talked a lot, about beading, about birds, fishes, nature and art. Esra is an artist. She artfully paints skulls, primarely with dots, and also on skulls. Not exactly what is called pointillism, which was a style born from impressionism, but rather the aborigenal type of painting. I like her work. Postcard of a painting by Esra. At first sight I thought that she covered skulls with beads, à la Jan Huling. I asked her if she would sell me a skull so that I can cover it with beads - she graciously offered me one and I am looking forward to playing with it. Watch this space! Esra's husband, Mick is also an artist. He is called a "Legendary Tattoo Artist". Google "Mick of Zurich" or have a look at a few images of this book dedicated to his incredible works of art. When I saw his work, I was very impressed - I have never seen something like this before. This man has amazing skills and is truly a precursor. His work makes you forget that the canvas is a body. I love to see the splashing fish, the bouncing water, the flowers, the Japanese deities. And his fire-breathing dragons are so beautiful too. Interestingly, it seems that somehow my love for Japanese art introduced Esra to my work - for she noticed my Kanagawa bangle in the book CGB vol no. 2. 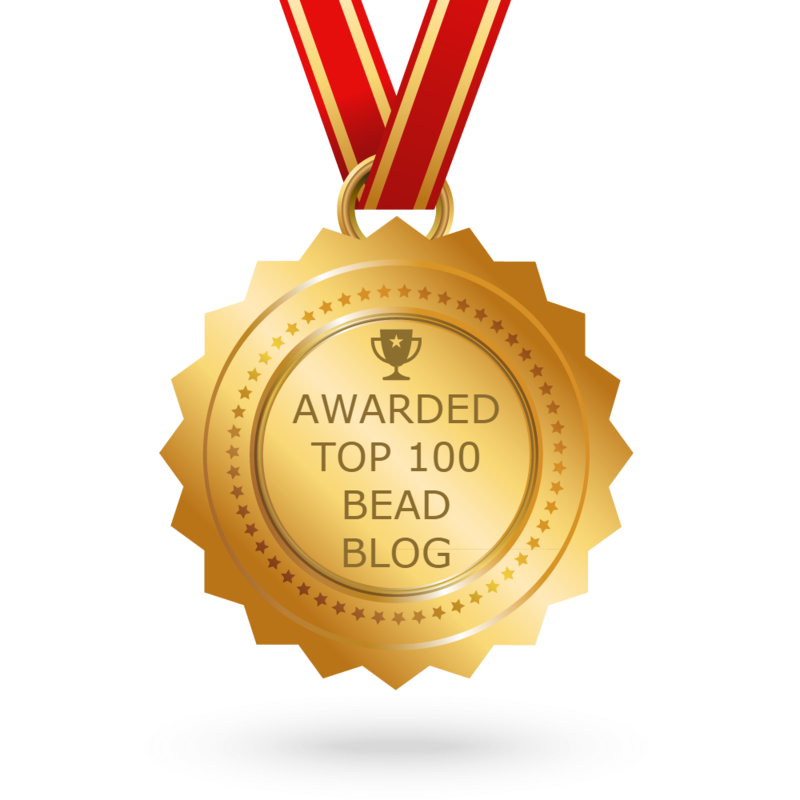 Esra started beading completely spontaneously many years ago. She wanted to cover bags with beads and didn't know how to bead but just went for it, without instructions or so. No internet back then. Her silk bag not only looks lovely, but is also very pleasant to touch. The way she made them is also interesting. Not RAW or DW or so. She just followed her instinct. 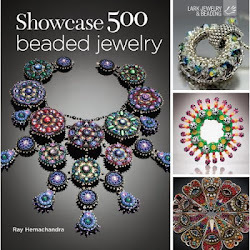 Over the years, her love for beads only grew, and she collected many beading books including the CGB and the Diamond Weave books. Beaded silk bag by Esra. Esra didn't need any help with the MRAW band at all - she showed me a gorgeous double red and black horned bangle and a beautiful green Rick Rack with perfect starts (so sorry, no pictures, we were totally absorbed in beading at this point). What she seemed to wonder was why an MRAW band was necessary and if hers was well done. Hers was beautiful*. To explain this subject better, I proposed to make an ordinary peyote start in the round with increases, for her to experience how fast it becomes stiff due to thread tension. 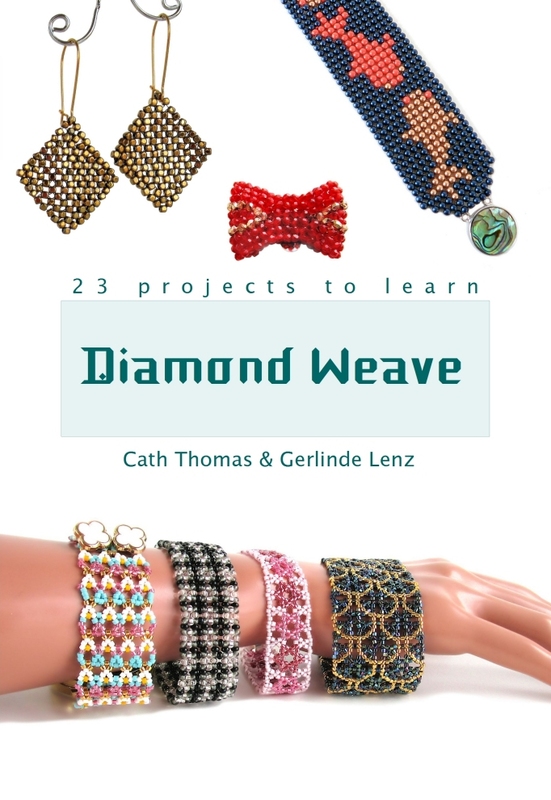 My Trapezino appears to be a cool project for this, because it is not too big, and also shows the magic of folding beadwork. 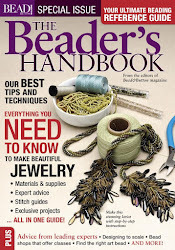 I also showed Esra the clever method proposed by Diane Fitzgerald to better control thread tension in long peyote starts (as explained for her Celtic Trefoil design published in a beading magazine). 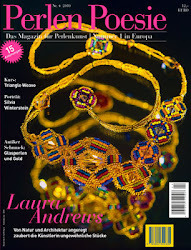 This way, Esra would have all the elements in hands to better understand why the MRAW band is so practical, but also why Kate is so busy developing news ideas, that is to cast beadwork off of triangles or squares (which offers starts for multiples of 3 or of 4). Esra left happy, and so I felt happy. And now I am going back to my beading trays and see if I can make more flames and waves and flowers... and transform that skull! *Esra included round beads in her MRAW band which made them softer and discreter than if they had been made with cylinder beads only. The result was very beautiful. **the zig zag shape of a Rick Rack only appears after a certain number of peyote rows added to the MRAW base. Due to the angle of the peaks (which is approx. 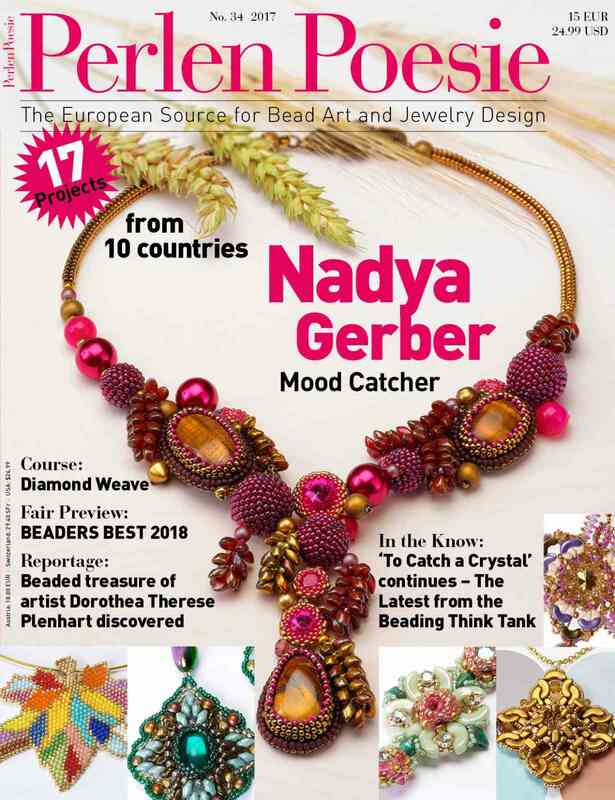 62° depending on the type of beads used, generally Delica or Aiko cylinder beads), the circumference of the beadwork will be more than twice as narrow than it initially was. 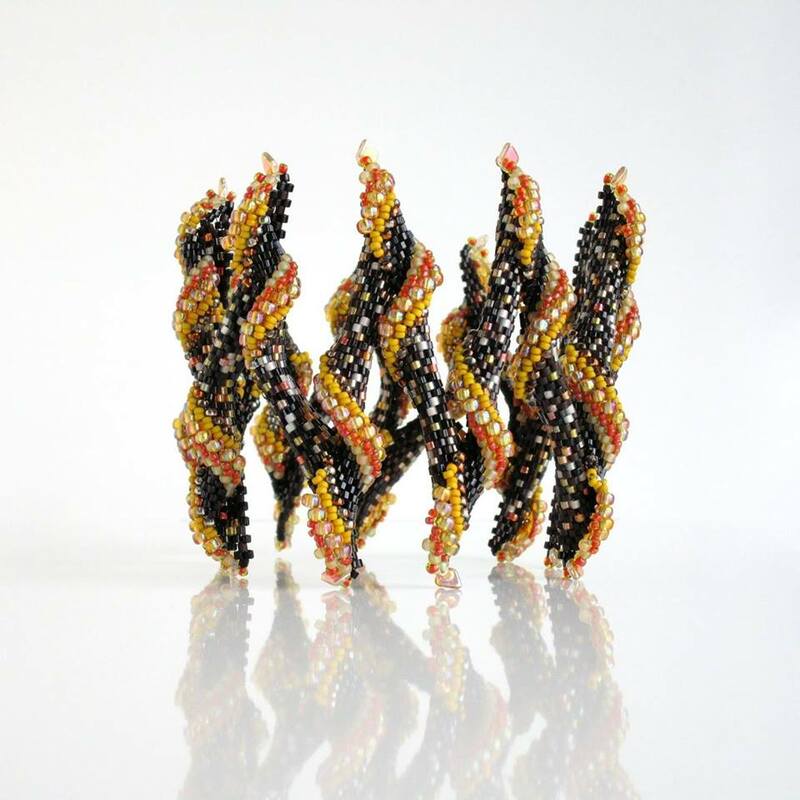 For their "Spin the World" March design contest, Preciosa Ornela sent me a selection of their Twin™ beads. Two types: transparent matted crystal and transparent matted grey Twin™ Seed beads and a green satin and opaque black Twin™ Pressed beads. Yep. 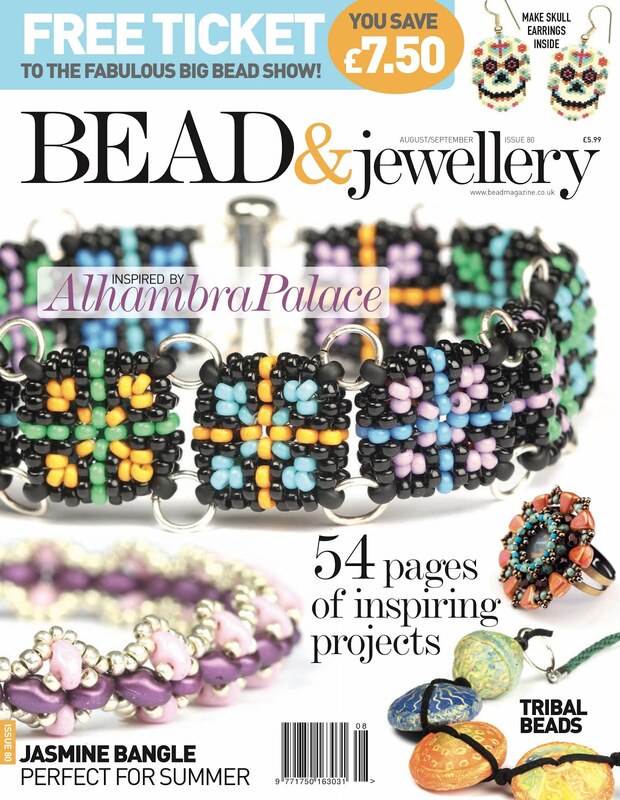 Seed beads and pressed Twin beads. And the pressed one is actually not brand new, but I now understand better why some Twin beads seemed to suit a project better than another. Read on (and click on the images to see big photos). 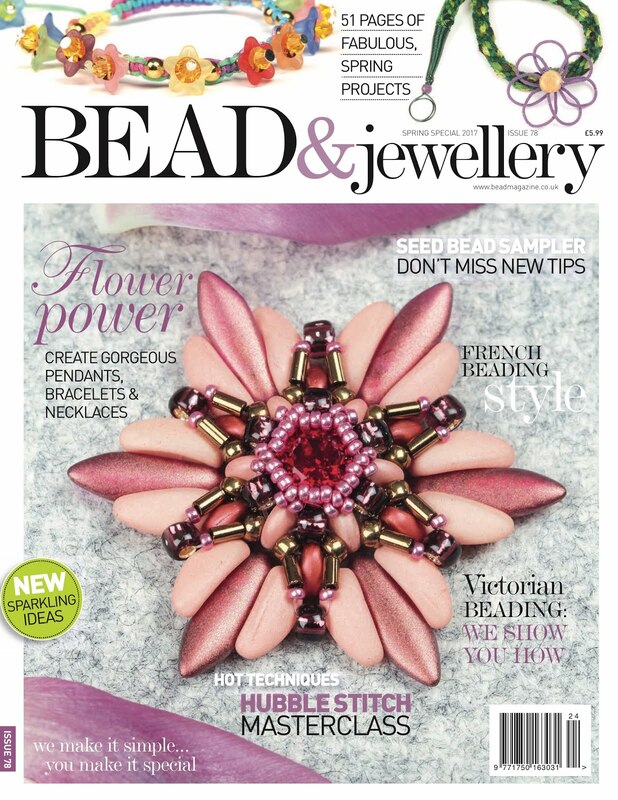 The first Twin beads we discovered several years back are what they call seed beads. 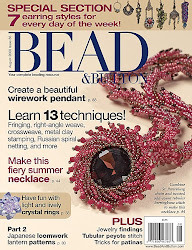 They are, as far as I know, the first two-hole seed bead to hit the market and ever since, manufacturers rival with new ideas to make more multi-pierced beads. 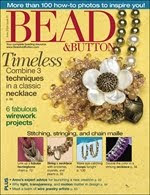 The seed bead Twin is oval, not always very consistent in shape, so a bit of culling is necessary. 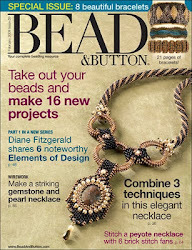 Overall, a very nice bead that offers plenty of design possibilities. 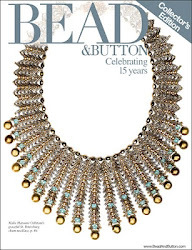 The pressed version has a horse-eye shape, thinner at the pierced ends and so offers more room for other beads between them. They are very consistent in size, resulting in a very even, flexible beaded fabric, at least in the samples I made with them. Beading with them is truly delightful. Twinastic! The package these new Twin beads came in also deserve a thumbs up, because it is extremely practical and clever: a little plastic box with a cardboard back acting as a lid. The cardboard has to be slid open and can be reclosed. Much better than little bags to tear open. Initially I planned to make Butterfly Ropes and Sera alla Scala necklaces, because these designs ask for them and I needed a cord for my reading glasses, and something for everyday. I started with the black pressed Twin beads, with pinch beads instead of firepolished beads. The cute Lady Bug look came as a nice surprise. I promise myself to make more of these, a green one for myself, and more for friends who fell in love with it too. Then, before I even got a chance to start a Sera alla Scala, my muse interfered and said no, no, no, make something new, something like "this". With "this", Eddie meant a small piece of dense beadwork with firepolished beads and tiny pearls - a test I made using Variation no. 9 of Diamond Weave in which I had substituted a number of parallel beads by Twin beads. I listened to my muse, because he is a clever guy, and also because I wanted to see what it looks like to use only two-hole beads in place of all two parallel beads, so I replaced all the firepolished beads and pearls by Twin beads too. I used the satin green pressed Twin beads and tried a perfectly matching yellow gold metallic size 11/0 seed bead, also from Preciosa, but the size 11/0 did not cover the thread enough. I then tried with tiny white 2mm pearls. and they worked beautifully! However, I wanted a more subtle accent color, so I grabbed a tube of size 8 charlottes and that was exactly the look I hoped for. I am very happy with the result. The charlottes are a delight when worn. With their 'only one facet', not all showing to the front, it blings beautifully here and there when moving the wrist, as by surprise. Believe me, not one photo does these subtle tiny treasures justice, you need to experience them in real life. Slightly domed yet supple, the bracelet has a lovely repetitive motif that reminded me of little pinwheels and of the clothes of the honorable members of the Académie Française, hence the name Academy Pinwheel Cuff. Honni soit qui mal y pense. To better show the pretty pinwheel aspect and see if I could incorporate true 2mm firepolished beads, I made a second cuff with the Twin seed beads. I chose to make it a continuous band, with elastic at the edges. Stiff, yet extremely comfy to wear, I love it! Because the result was so encouraging with the Twin seed beads, I had to try with other two-hole beads. 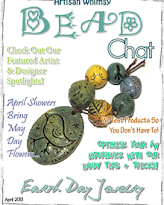 Here again, I was happily surprised by the result when using Ios® beads by Puca. I used true 2mm firepolished as accent beads in the ivory version and 2mm matte hematite rounded cubes in the satin copper version and both worked very well. 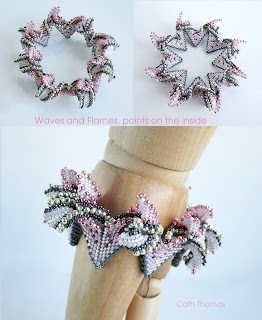 I find it so pretty that I decided to write a tutorial as soon as I have a moment (I am still working on the Farfalle stitch tutorial - soon finished). 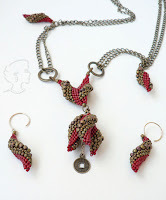 I also tried this stitch with Rulla beads, which didn't work at all, and then my attention got back to the Sera alla Scala necklace I initially planned to make. And I made another Sera alla Scala rope with magic topaz and black pearls.